If you're itching to get behind the wheel of an undeniable timeless classic, it would be awfully difficult to do better than this 1956 Chevrolet Bel Air. It's a member of a class of mid-'50s Chevys that forged an unbreakable link as part of true American car culture and, with its outstanding curb appeal and meticulously restored look, would be equally at home making an impact on the local car show circuit as it would pulling focus on the boulevard. The red and white two tone combo is to die for and will catch everybody's attention. The interior is put back to exactly how the car would have looked in 1956. The seat upholstery in this car is special because it was shrinked wrapped sometime ago to preserve them for the future. The original seat upholstery looks to be in excellent shape due to this. The 265 and powerglide combo are freshly rebuilt and run great. This is an excellent, comfortable, stylish cruiser that is screaming to get on the road! The 1956 Bel Air received a face-lift with a more conventional full-width grille, pleasing those customers who didn't favor the Ferrari-inspired '55 front end. Distinctive two-tone bodyside treatments and graceful front and rear wheel openings completed the "speedline" restyling. Single housings incorporated the taillight, stoplight, and backup light, and the left one held the gas filler - an idea popularized on Cadillacs. 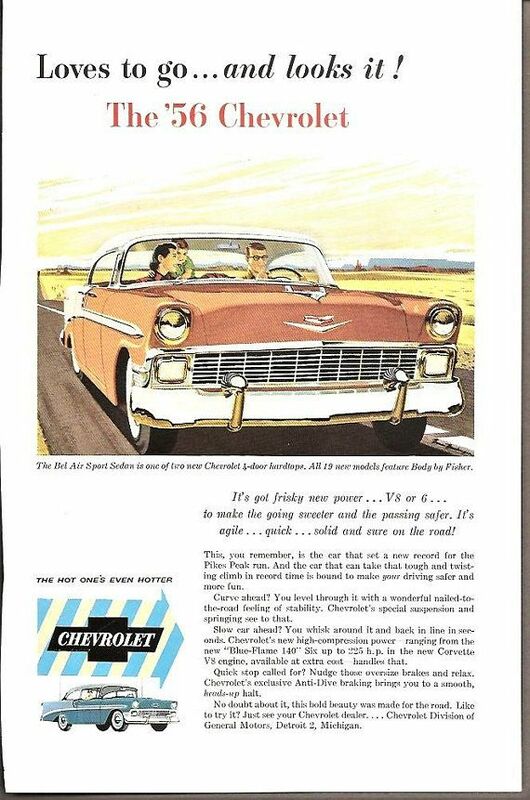 Among the seven Bel Air models was a new Sport Sedan, a pillarless four-door hardtop that looked handsome with all the windows rolled down and allowed easy entry into the back seat. Production exceeded 103,000, compared to 128,000 two-door hardtops. Shapely two-door Nomad wagons topped the price chart at $2,608, but now carried the same interior and rear-wheel sheetmetal as other Bel Airs, lacking the original's unique trim. Only 7,886 were built. The least costly Bel Air, at $2,025, was the two-door sedan. Seatbelts, shoulder harnesses, and a padded dashboard were available, and full-size cars could even get the hot Corvette 225-horsepower engine. In 1956 sales material there was an optional rain-sensing automatic top. Popular Mechanics reported only 7.4% of owners in their survey ordered seat belts.